Dr. A.P.J. Abdul Kalam Technical University (AKTU) also known as Uttar Pradesh Technical University is scheduled to conduct Uttar Pradesh State Entrance Examination (UPSEE) on 16th, 22nd, and 23rd April 2017. A huge number of candidates who are looking for the admissions into B.Tech, B.Arch, B.Pharm, BHMCT, MBA, BFAD, BFA applied for the examination. Candidates who had applied can download UPSEE Admit Card 2017 from the direct link provided below. The entrance examination for degree level engineering institutions and other professional colleges has been assigned to Dr. A P J Abdul Kalam Technical University Uttar Pradesh, Lucknow by Govt. of Uttar Pradesh. Further, the Govt. of Uttar Pradesh, Technical Education Department, has consented for the constitution of Central Admission Board (CAB) under the Chairmanship of the Vice Chancellor, Dr. A P J Abdul Kalam Technical University Uttar Pradesh, Lucknow to supervise and control the State Entrance Examination herein after referred as UPSEE-2016 being conducted by Uttar Pradesh Technical University, Lucknow. The CAB has absolute rights for conducting UPSEE-2016, and to decide about modalities of admissions and allotment of seats. The jurisdiction of CAB extends to colleges / institutes affiliated to AKTU, Lucknow. The CAB is authorised to take every decision regarding conduct and admissions through UPSEE-2016. Candidates who had applied can download the admit card from the official website. 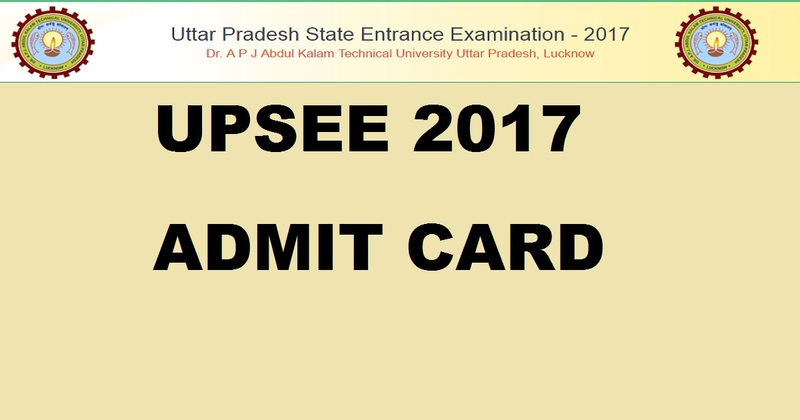 AKTU released notification and invited online applications for the UPSEE 2017. A huge number of eligible and interested candidates applied for the exam. Candidates who had applied can download admit card from the direct link provided below. Without admit card candidate is not allowed to write the exam. 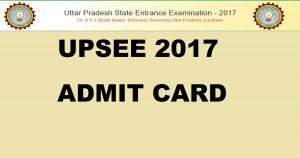 How to Download UPSEE Admit Card 2017? Click on AKTU UPSEE Admit Card 2017. Stay tuned to this website. We will update UPSEE 2017 answer key, results here. Press CTRL+D to bookmark this page for easy navigation.